Madison Cote, a doctor at a charity hospital in Mali, is arrested at gunpoint on a fabricated motoring offence by the corrupt Malian police. Her only hope of freedom lies in the hands of notorious warlord, General Karim. In exchange, Karim demands that Madison transports drugs in her truck. Desperate and in fear of her life, Madison reluctantly agrees. Upon her release, she informs the French embassy of her deal with Karim and is recruited to provide intelligence on his drug trafficking. Chip Chapman is looking forward to the start of his Royal Air Force training when he's injured in an avalanche. Upon awakening, he's utterly amazed to find himself in a bed in Mali! Worse is to follow - he discovers he's been captured for his piloting skills and is a 'guest' in General Karim's compound. Further investigation provides Chip with evidence of young boys being drugged and trained as Karim's soldiers. Now it's up to Chip and Madison to put an end to the warlord's reign of terror once and for all. 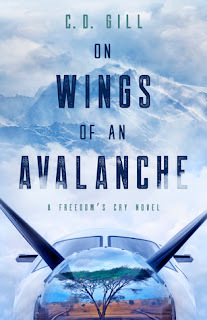 On Wings of an Avalanche was a satisfyingly good read. It was refreshing to have a female protagonist who was educated, empathetic and dedicated to her profession. However, I was a little disappointed Madison and Chip didn't cross paths until 82% into the book (I read the Kindle edition) - it made the story feel slightly disconnected. On the whole, I thought the plot was good and easy to follow. I could put the book down and pick it up later without the need for backtracking or re-reading. The writing flowed and the author's descriptions of people and places were faultless. Without giving any of the plot away, I especially enjoyed boy-soldier Nafy and his glittery shoes - an excellent inclusion. My thanks to author C.D. Gill for providing me with a copy of this book. A struggling charity hospital, visa troubles, and an arrest at gunpoint leave Dr. Madison Cote at the mercy of the corrupt Malian police. Rescue comes at a price when a warlord demands that she traffic drugs in exchange for her freedom and his protection. When the French embassy enlists her to relay intelligence on the warlord, Dr. Cote’s trapped as a civilian double agent, facing an immediate death sentence if she’s caught. Royal Air Force recruit Chip Chapman needs to prove to himself that he can be more than his abusive father. 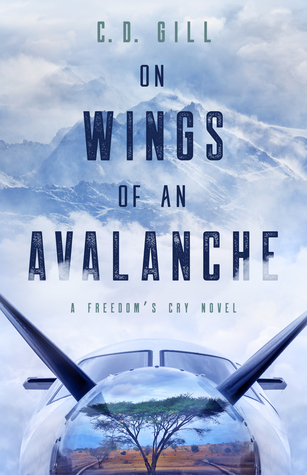 A week before basic training, an avalanche replaces his dreams of heroism with raw survivalism. Taken captive for his piloting skills, Chip plans to escape until he uncovers war crimes no human could ignore. Both pressed into servitude, Dr. Cote and Chip forge a desperate alliance. But with lives in the balance, their allegiances and honor will be the least of the sacrifices required to topple a warlord.